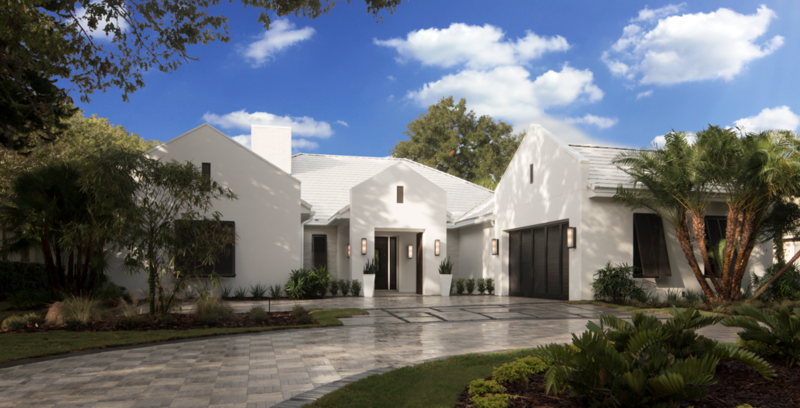 Design/Construction/Interiors: Phil Kean Design Group, Winter Park, Fla. When it was built in 1987, this Orlando, Fla., house was hitting on all cylinders, delivering the latest and greatest in residential design. But 30 years later it sorely needed a tune-up. Now it has roared back as The New American Remodeled Home, a complete makeover featuring a bold new design, and the best in housing products and technology. decade and the first to join The New American Home at IBS. 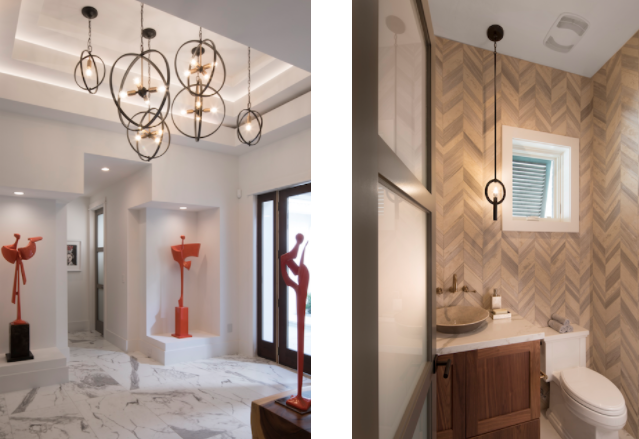 The dazzling transformation, produced by Phil Kean Design Group (PKDG), a residential design/build and interiors firm in Winter Park, Fla., is a fresh and classy testimonial to today’s lifestyles and high-tech must-haves. For remodelers, Kean says, such 30-something houses represent a major business opportunity. And the inspiration starts here. Simple geometric planes and a welcoming entry extension replace the confusion of details that marked the old façade (below). Adding to the clean stone and stucco finish detailing are louvered shutters that match the entry gate and garage doors, plus new concrete roof tiles. The existing 1987 home was sturdy but stale. On the plus side, it was a solidly built 4,440-square-foot house on a concrete block foundation with high ceilings, three first-floor bedrooms and adjoining baths, a spacious living area, and an upstairs game room. The house boasted a lanai and backyard pool on a large pond-side lot. The problems? 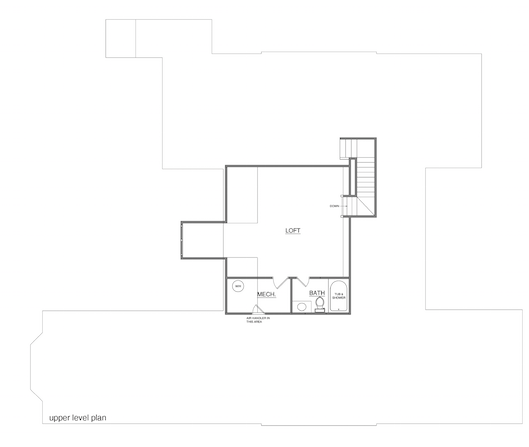 A failing floor plan; dreary finishes and colors; dated wet rooms; light-starved spaces; obsolete mechanical, electrical, and HVAC systems; and a skimpy envelope that wasted energy. Starting in late 2015, PKDG stripped the house down to the studs and roof trusses and created a luxurious contemporary island-style home within the existing footprint. It lives much larger than the old house but adds just 187 square feet via a bump-out on the second floor. Originally, the living area consisted of several minimally linked spaces; narrow doorways connected the central living room to a dark family room and a boxy, obsolete dining room. The kitchen and breakfast areas were shoved to the side and sandwiched between the dining room and garage. Kean erased this choppy setup, replacing it with a bright, open, and dramatic gathering space. 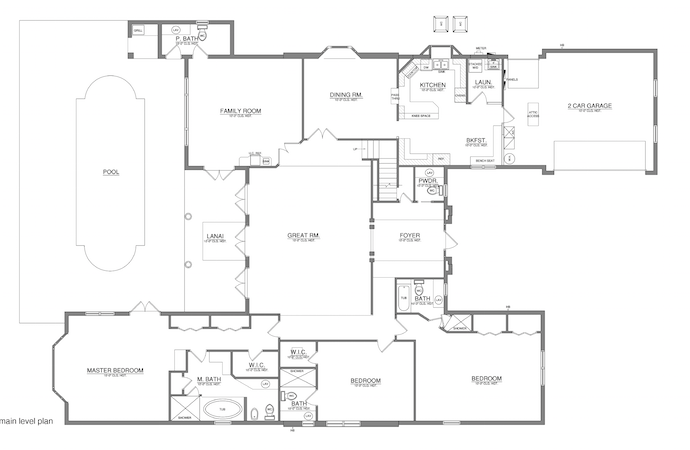 Living, family, and dining areas merge into a sweeping great room with a conversation zone on one side and a well-appointed kitchen and breakfast area on the other. The old kitchen and breakfast spaces are now put to better use as a pantry, office, mudroom, and mechanicals closet. On the other side of the U-shape house, Kean reallocated space in the private wing to give the three bedrooms clean lines, upscale bathrooms, and ample walk-in closets—including large his and hers closets in the master suite. Window sills in the front rooms—a bedroom and the powder room—have been raised to admit light but afford privacy. Real estate agents who saw the house before it was remodeled say the second-floor game room was simply unusable. Basically a loft with pitched ceilings, it had minimal headroom and circulation space, and the rear-facing dormer window added little. PKDG raised the ceiling to a uniform 9 feet and expanded the space by replacing the dormer with an extension across the back. Now accessible by an elevator as well as stairs, the second floor has become a flex space, incorporating a large multipurpose area, a wet bar and eating counter, a closet, and a luxurious bathroom. In front of the house, Kean brought the entry forward with a covered atrium that’s dressed up with elegant water features. At the back of the house he refreshed the leisure area with a new swimming pool in a contemporary geometric profile, a fire pit, and a fully equipped outdoor kitchen and eating bar. By reducing the size of the pool bathroom, he made space for a wine room off the breakfast bay. Big windows and sliding glass doors now fully connect the dining room, great room, and master bedroom to the pool, which was rebuilt in a geometric configuration that complements the house. The new lanai is tucked under the new second-floor dormer and is shielded by a full-length motorized screen. 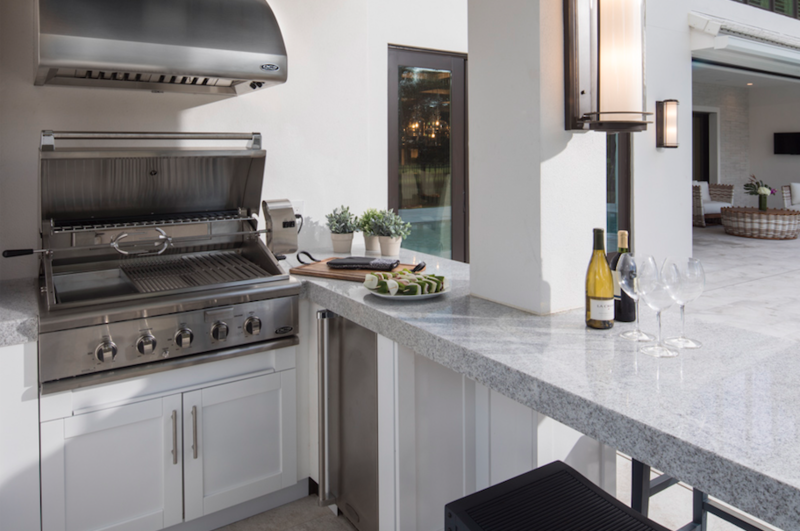 A deluxe summer kitchen and eating bar complete the outdoor living space. “Typical of its time,” Kean says, the 1987 house “was plain Jane.” We’re talking blank ceilings, swaths of bare or ugly papered walls, basic windows and doors, bland floors, mauve carpeting, economy-style bathrooms, a kitchen ensemble of dull cabinets and counters and mismatched appliances, boring light fixtures, and bare-bones closets. At the same time, the house suffered from architectural clutter, such as frivolous railings and trim on the outside, distracting arches and columns on the inside. The New American Remodeled Home turns all this around. Far from “plain Jane,” the house sparkles with the finest in finishes, fittings, fixtures, appliances, and lighting. New windows and doors are as big and beautiful as they are energy smart. As for the clutter, PKDG replaced it with clean, contemporary planes on the exterior and a crisp interior layout. 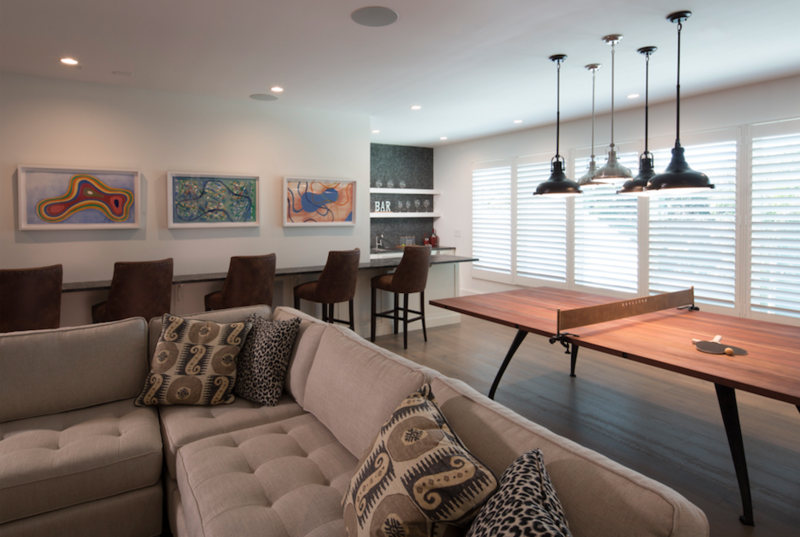 The remodeled house exudes new vitality and excitement. Kean attributes some of that magic to the distinctive details—and there are loads of them. Together, these special features radiate character and enhance the pleasure of being in the house. Kean points, for instance, to the display of large, lighted art niches that stretches across one wall of the great room. A 6-foot-wide gas fireplace with color-changing LEDs fills another. 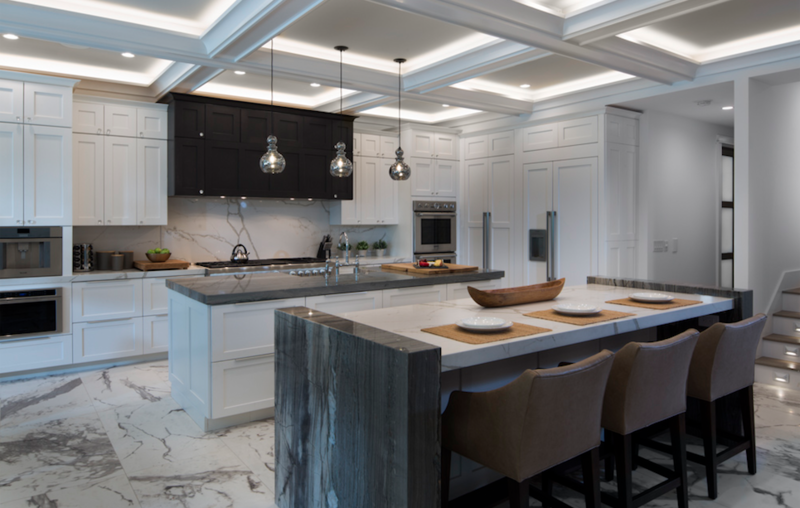 The coffered ceiling in the great room and kitchen is another inspired detail, which adds style, definition, and uniform lighting to those spaces. A cluster of harmonious, but not identical, pendant lights lends wit and a one-of-a-kind look to the breakfast area. Chic light fixtures around the house, from the entry to the closets, reinforce that attention to style. Impressive built-ins add to the star quality of the closets. Super-size marble-look porcelain floor tiles throughout the main floor are showpieces. Their light tones add to the fresh, bright feel of the space. So do the large glass sliding doors. Those on the pool side of the great room can slide into the wall to open the room fully to the lanai. A retractable overhead screen can shield the lanai or completely recede for an open connection between great room and pool deck. Wood-look laminate flooring takes on a fresh role as wall covering in the new mudroom. A feast of stylish tiles, fixtures, and fittings makes each of the bathrooms a standout for comfort and good looks. The kitchen is a dream come true, with twin islands for food prep and socializing, gorgeous finishes, and a suite of luxury appliances and extras including a wall-mounted coffee machine and a wine room with three refrigerated wine towers and a tasting table. In striking contrast to the jumble of mismatched elements of the old kitchen (before photos, below), the new one is an eye-popping feast of appliances, finishes, and seating options. The two marble-topped food prep and eating islands hold ample storage drawers, and the white door panels on the refrigerator and dishwasher blend with the kitchen cabinetry. Dual wall ovens, and microwave and refrigerator drawers complete a suite of luxury appliances. 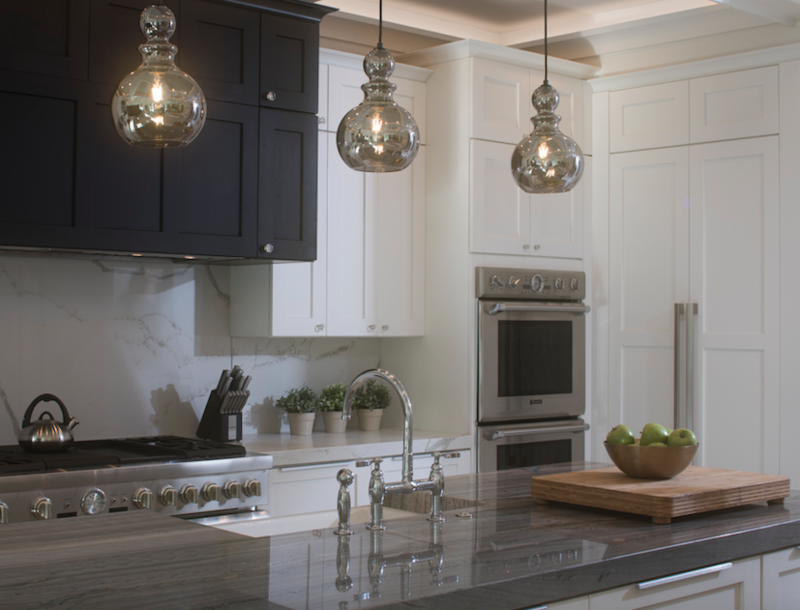 Well-placed pendant fixtures add light and style. 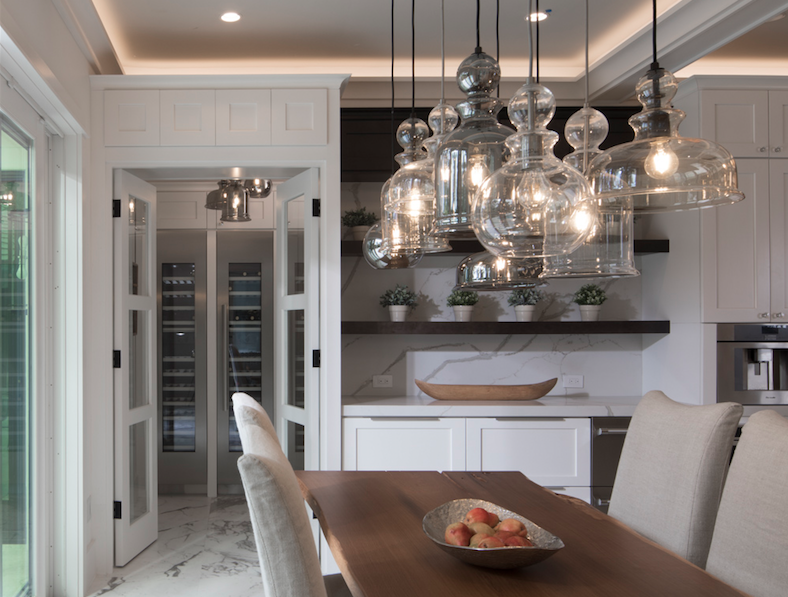 The sun-washed breakfast bay connects to a wine room with refrigerator and tasting table. As with most remodels, The New American Remodeled Home involved surprises and construction challenges. Revamping the entry foyer, for example, presented a small problem. PKDG removed the barrel ceiling and the columned wall between foyer and great room to open and brighten the space. The new foyer, along with the short adjacent hall and powder room, would have coffered ceilings and clean, square wall corners. Trouble was that the second floor stairway is behind the hall wall, and the stringers supporting the last few steps hung below the great room ceiling. “Without changing the footprint of the steps and winders, we cut off the stringers at the common wall to the under-stair closet and replaced them with platform framing within the confines of the floor joists,” says project manager, John Taylor. Now the ceiling is flat and trim. To balance the slim wall hiding the stair structure on one side of the hall, PKDG built a matching wall on the other. Tall niches in those walls display colorful sculptures. Another issue was building a new supporting structure across the rear elevation—“One of the biggest challenges of the project,” Taylor says. To open up the first-floor space and expand the second-floor room, the PKDG crew removed the window dormer and the back half of the main roof and trusses over the second floor room and the back of the lanai. They then constructed a full-height second-floor wall, installing several long engineered-wood beams to carry the loads, while incorporating clearance for the lanai’s retractable screen. Two beams run perpendicular to the sliding glass door and support the side walls of the second-floor game room, another beam runs directly over the telescoping glass doors, and another creates the pocket for the lanai’s retractable screen. Loading had to be redirected and concentrated onto points where new foundation was added. “Where existing footers were in the right location but were not large enough, we engineered ‘bearing enhancement,’ in effect adding to both sides of existing footings,” Taylor says. 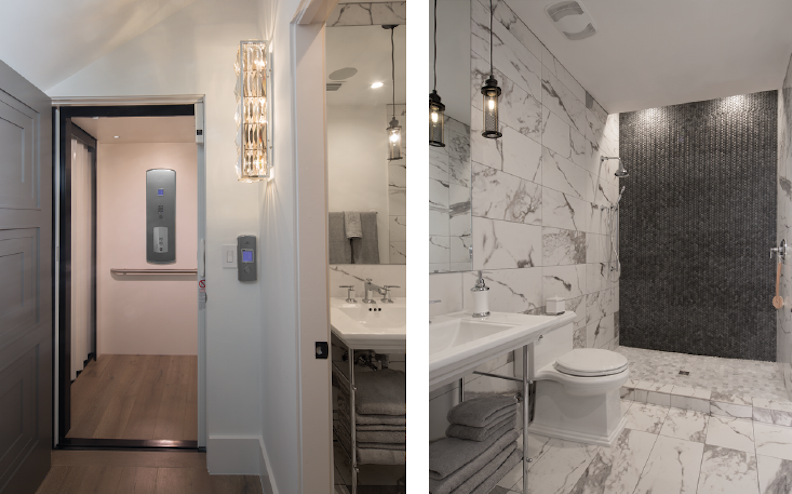 “With the floors cut open for footers and new shower recesses, we also installed totally new underground plumbing supply and waste systems.” Push-to-connect fittings and flexible pipe accelerated the work of installing water supply runs throughout the house. The heart of the remodeled house is a large, bright space that’s open but organized, with an inviting gathering area at one end and the kitchen and eating zone at the other. 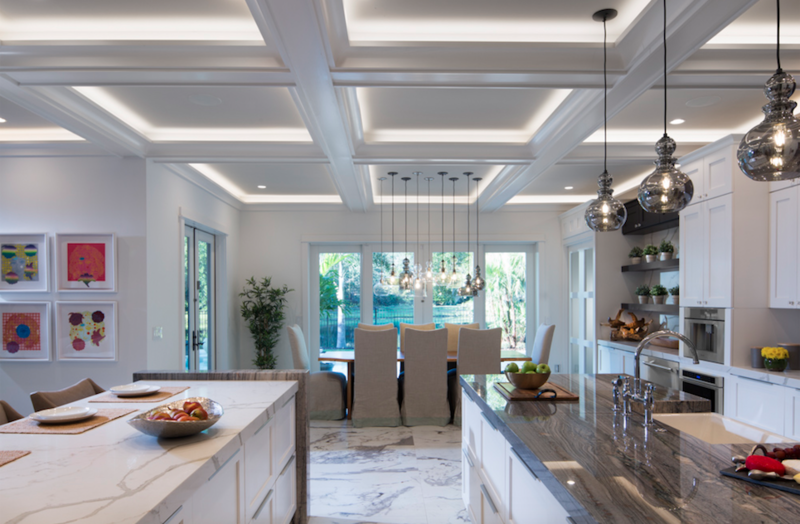 Lighted coffered ceilings and marble-look porcelain tile floors unite the space; an eating island marks the border between areas. When open, the sliding glass doors (below) fully retract into the wall, merging the room with the pool area via the lanai, which is protected by a full-length motorized screen concealed in the ceiling. It’s all a spectacular change from the dim, walled-off 1987 living space (above, left). The old master bedroom suite wasted its premium location at the back of the house. The remodeled suite uses generous windows and sliding glass doors (above) to take advantage of expansive pond views and to provide access to the pool. 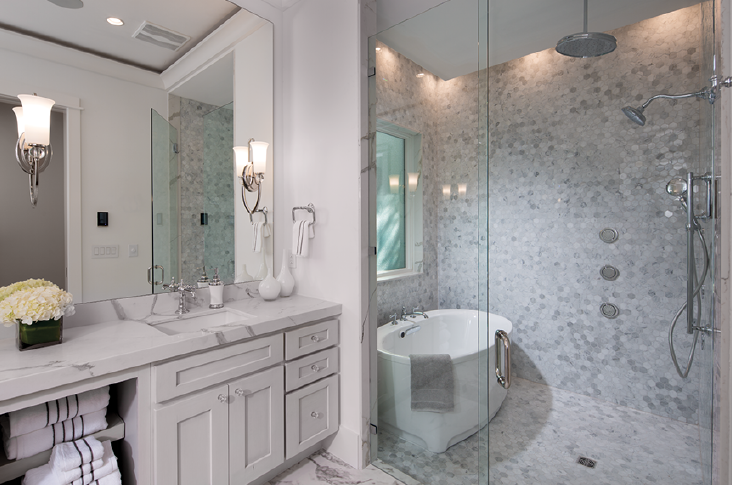 The master bathroom was converted from an awkward space (left) with chintzy furnishing, fixtures, and fittings to a well-organized room that includes a broad, twin-lav vanity and an elegant tub-shower zone (below). Large walk-in closets for him and her replace the suite’s substandard closets. Transformed from a stiff, dated space (left), the foyer now celebrates the contemporary, open look of the remodeled house (above left, and below). The tired barrel ceiling and formal columns were replaced by a brightly lit, deep tray ceiling flanked by sculpted display niches. Airy light fixtures add to the arty, upbeat ambiance. The gleaming Carrara marble-look porcelain flooring introduced in the foyer extends throughout the house. Though compact in size, the remodeled powder room (above, right) just off the foyer is big in style, with beautiful fixtures and finishes, and a high, shuttered window for privacy. In terms of environmental comfort and energy consumption, the 1987 house was typical of its time but a loser by today’s standards. The envelope leaked like a sieve, thanks to single-pane aluminum windows and glass doors, leaky ducts, and poor wall and roof insulation. Electricity use was high, as the HVAC equipment, appliances, and water heater were inefficient and the dozens of light fixtures using incandescent bulbs wasted energy. The house sucked up 2,100 gallons of water a week through water-hogging toilets and faucets. Hollow-core interior doors did little to control noise transmission. 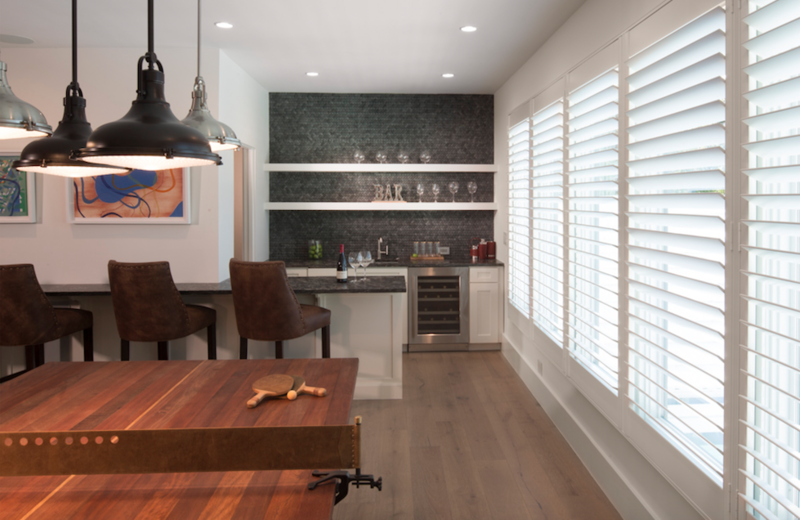 By contrast, The New American Remodeled Home is a model of leading-edge environmental design and energy efficiency. Drew Smith, of Two Trails, a sustainable building consulting firm in Parrish, Fla., expects annual savings in energy costs to be more than $1,500—a cost reduction of almost 50 percent. And the house is far healthier and more comfortable than before. Smith checks off improvements in many areas, starting with Insulation. Core-fill and polystyrene-foam boards provide R-13.3 wall insulation. The thermal shell features an unvented and air-sealed attic with average R-20 open-cell spray foam insulation. Elevated battens in the high-efficiency, impact-rated concrete roofing system prevent fasteners from penetrating the roof underlayment and enable efficient flow of water off the roof. Large roof overhangs shade the house, and the white exterior walls reflect the sun. All windows and exterior doors are well-insulated. The clad-wood windows are double-pane with low-E coating and argon gas fill. Caulking of penetrations around ducts and recessed can lights, at drywall seams and at other openings beefs up the environmental seal. The direct-vent blower for the great room fireplace circulates fresh air, so that no gases escape into the living area and little heat is lost through the flue. Upgraded 5-inch pleated MERV 13 filters on the air handlers provide superior air quality. The retractable screen between the great room and pool offers insulation in hot and cold weather. State-of-the-art drywall in the house includes a product that absorbs VOCs from cleaners and off-gassing and converts them to harmless organic compounds. Another drywall product contains a membrane for sound absorbency. High-quality, frosted glass interior doors help contain sound while admitting light. All the appliances are Energy Star rated along with the air ventilation systems, bathroom fans, and heat pumps. Light fixtures are low-voltage LED units. Low-flow toilets and lav faucets reduce water consumption to 960 gallons per week, netting a projected savings of almost 55 percent in water use. Five tankless gas water heaters efficiently supply hot water on demand to the whole house, including the high-performance shower in the master bathroom. Before the remodel, Home Energy Rating System (HERS) testing gave the house a relatively poor HERS index score of 120; the remodeled home’s HERS score came in at 45. And blower-door testing showed the house to be “very airtight,” says Smith. He says the house is targeted to receive Emerald-level certification through the National Green Building Standard program as well as Energy Star, EPA Indoor airPLUS, and DOE Zero Energy Ready Home recognition. In other words, the New American Remodeled Home combines the best of the best: a tight yet breathable envelope, outstanding energy efficiency, and technology that supports a pleasurable, luxury lifestyle. The second floor, once an afterthought, is now a large, versatile flex space suitable for parties, relaxation, or overnight guests. It features a sweep of windows overlooking the pool area, a roomy wet bar and eating counter, and a stylish bathroom complete with walk-in shower, pedestal lav, and pendant lighting (below, right). The reconfigured stairway, with under-tread safety lighting, is paired with a residential elevator (below, left) accessed from a hall just outside the first-floor guest bedrooms. 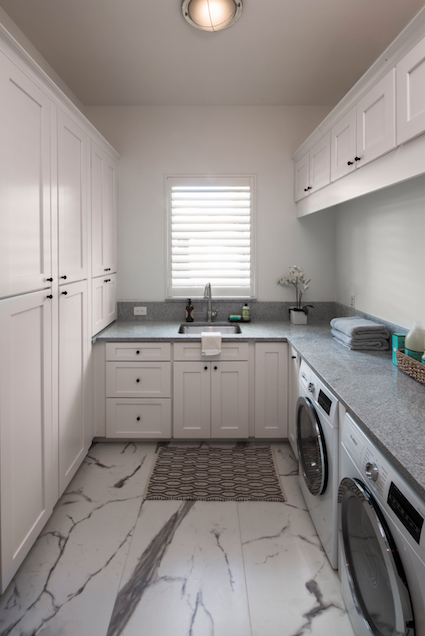 A few more square feet, an added window, and a complement of cabinets and granite counters transformed the dark, lackluster laundry room into a pleasant and functional workspace for washing, drying, sorting, and folding laundry. Wendy A. Jordan is a freelance writer based in Washington, D.C. Double cover is a half and half framework made of fiberglass (FRP/GRP) structure outside and particular thermoplastic or fluoropolymer liner inside. The liner is coordinated to particular concoction prerequisites to improve life span including the capacity to withstand high-temperature necessities or scraped spot resistance.